Number of participants: maximum 20 people. Technical level of participants: learner-teachers should be at a minimum of intermediate level in acrobatics. They should be physically prepared for 5 hours training a day and have a knowledge of basic partner acro tricks. If they are at a higher level than this they should consider that the point of the workshop is not to elevate their level, but to widen their repertoire and to discover new approaches and methods of teaching. They should be open to act both as flyer and base. The participants do not need to arrive as acro partners, as we prefer them to work openly with any member of the group. The answers to these questions will be incorporated in experimental learning and discussions. The teaching methodology is by experimental learning and group discussions. Experimental learning means learning by doing, so learners participate in a class where they will actively learn what to do with their students, and thus understand how they can teach it to their students in the future. The discussions with the teachers serve to clear further questions about the applied methods and help to absorb the experience at a conscious level. Other types of discussions will be realized with the participants on the last day, which serves to help digest what they learnt during the week. There will be an exchange of ideas in how others can put them in to practice. This discussion will be moderated but not led, as its objective is to realize how to work autonomously using the new methods of teaching. With the help of three teachers we combine three different approaches to partner acro. 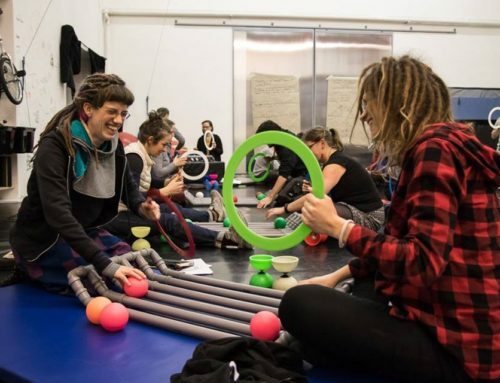 – Réka Hargitay: will help us learn usable teaching methodologies for groups with limited or poor physical conditioning, focusing on partner acro as a physical interaction. – Noel Spauwen helps us to widen the repertoir of our partner acro tricks, sharing his way of teaching. 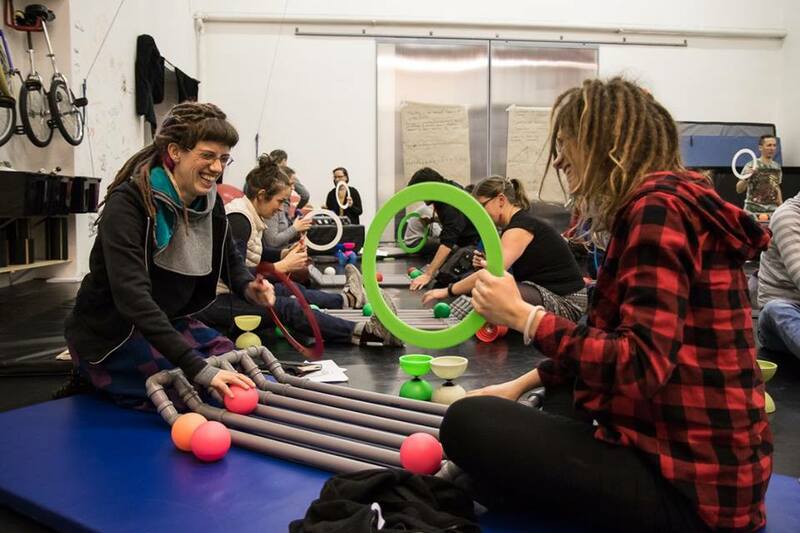 It is useful for teachers of circus skills to be shown varying methods of teaching (as will be demonstrated by the three teachers outlined above) so they can add new ideas to their ’tool belt’. 22 hours of led sessions with the teachers and 7 hours of discussions. As it is a very physical subject, we will hold 5 hours physical work combined with breaks, and a conclusive discussion to end each day. Three different types of sessions with 3 teachers working separately, showing different methodologies. Tibor Kőműves is a current teacher at the Hungarian National Circus School, teaching acrobatics, specialising in hand-to hand. On the side he is a trainer at several sports clubs and competitors of taek won do, horse riding acrobats, synchronised swimming, and roller skating- providing them further specific training in acrobatics. 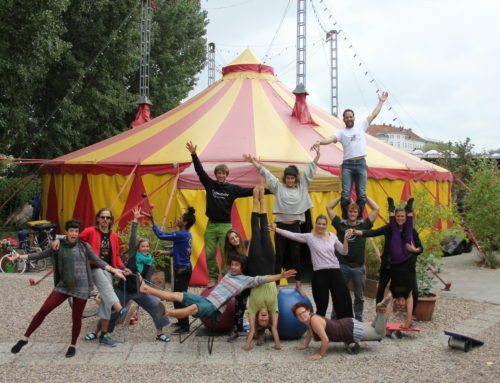 He has worked on contracts in European circuses, vaudevilles – theatres, gala programmes and TV shows: Tivoli Copenhagen, Circus Barum, Circus Krone, Circus Grüss, Conelli Zürich – gala, Royal Pallas etc. Focus is to provide basic preparative training of acrobatics, using excersises which give the background of the partner acrobatic tricks. To create a strong foundation using gymnastic trainings about muscle conditioning, body consciousness and body coordination. 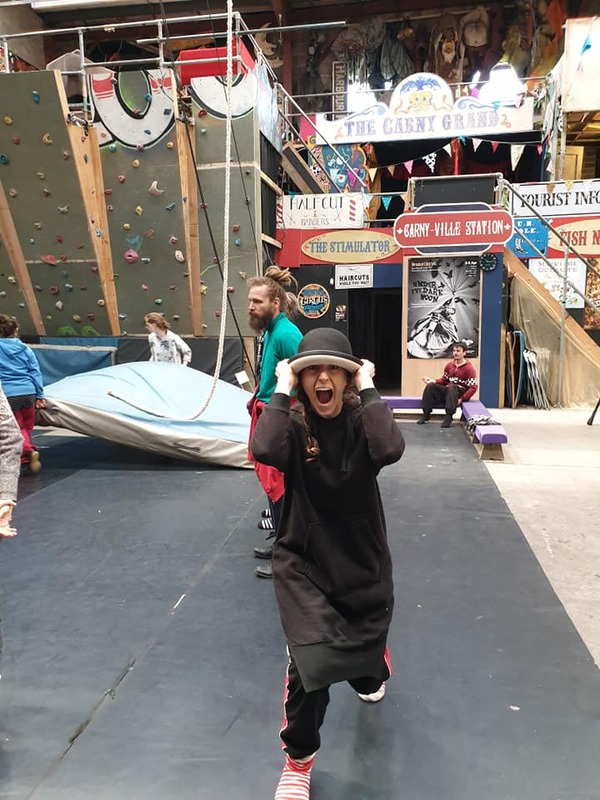 Learner teachers will be taught a collection of basic excercises which can be used to teach student groups in order to have a good base to build acrobatic tricks. He features a series of preparative excercises for handstands, headstands, cartwheels, rolls and saults which are all necessary to execute partner acrobatics and hand-to hand figures. He will not teach partner-acro tricks or figures, but rather the basis of what is required physically to be able to perform partner acro safely and strongly. Reka Hargitay dedicated her professional career to spreading internationally the ideas and practices she feels passionate about. Her yoga journey started in 1999 with Hatha Yoga, and soon she discovered many other yoga styles. She sticks mostly to Vinyasa Flow, Hot Yoga styles and Ashtanga Vinyasa Yoga in her own practice. Since 2008 Acro Yoga keeps elevating her yoga and sharing practice in a whole new dimension: Trust, Balance & Joy – a playful celebration of caring human connection. Creating a safe and supportive environment in her classes, she offers progressive steps for each persons individual needs and current abilities to build upon: establishing contact, succeeding in acrobatic bodyshapes with ease, shifting perspectives and letting go in the therapeautic practice to create a game. In order to establish connection and sensitivity we will work in a circle as symbol for community, equality and integration of members. We work towards the awareness of self as part of a whole, a higher level of body consciousness, precise in the direction of focus and towards connecting awarness of breath and motion. The sessions will combine partner yoga elements, games and flying (L-basing) among other excersises, and wil finish with learning therapeutic practices. Partner yoga encourages interaction, establishing physical connection, creating mutual benefits by synchronized movement patterns (static or dynamic), finding agreement in non-verbal communication “codes”, giving feedback by asking for one’s needs and by being receptive. Games are the playful way to build trust and to train several further skills: reaction and focus, interacting with playfulness, effective and empathic communication, awareness of space, embodiment of body positions, gradual weight- shifting, increase in spontaneity and creativity, and to sense community in laughter and joy. Building foundation will be realized through pyramids and counterbalances, to experience and deepen the knowledge in dealing with weight, laws of gravity, finding ones centre of weight, understanding bonestacking, assisting others to achieve their goals, first approach to spotting / safety techniques, experiencing potential of community. Flight or flying refer to different L-basing positions. Layering the content in progressive steps and learning to break down content into further micro-steps, will enable students to adjust the content to their participant’s actual needs and if desired, to take a step back in order to make learning an experience of success. Cool down and massage will be an important part of the session. This is for learning about self-care and care for others. Giving and receiving healing touch allows us to understand and communicate one’s own needs, to understand and accept the needs of others, to open up for listening on several levels, to be sensitive and to make individual adjustments when needed. 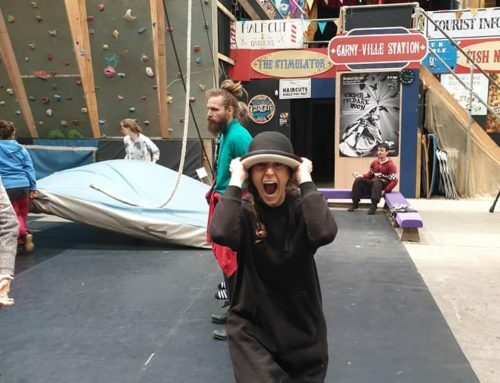 Noel has been teaching acrobatics for more than 30 years in various settings and levels of weekly groups, festivals and special groups in over 15 countries across Europe, in the USA and Israël. He started his acrobatic career in the dutch “Como-Brother-School” and passed their exams in the eighties. Over the years he has been taught by many different teachers. During 1985-1995 he performed with the trio “Drie Hoog Achter” in streets and festivals in Western Europe and 1996- 2012 with “de Tuymelaeren van Mahou” and in various other duos and groups, and in his “acro-talk-show”. In the long history of teaching and performing a lot of new movements and technical details emerged, that are more and more spread in the world of partner acrobatics. And they appeared in 2012 in his book:”Noël’s Acrobatic Elements and Connections” (www.acronoel.wordpress.com ). He has taught many trainings for teachers in acrobatics and other social skills. He studied social and organisational psychology with focus on how people learn in groups. He is always searching for the steering spirit that grows in and guides groups. 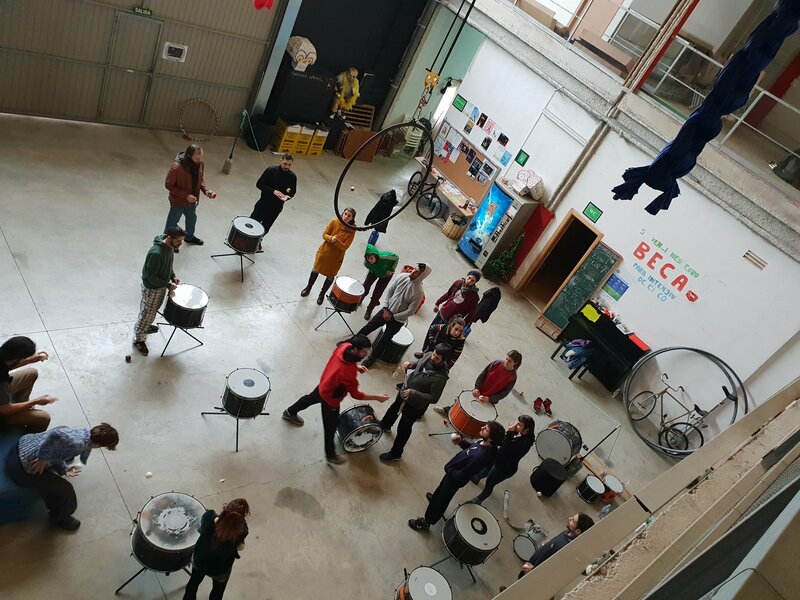 Because of his varied background the concern in the lessons is not only the technique but also the way of working together and the fluent connection between parts. The first workhop is the most important for teaching and learning. The second for the exploration of doubles and trios, and the third for helping to think creatively in what your body can do in cooperation with another. 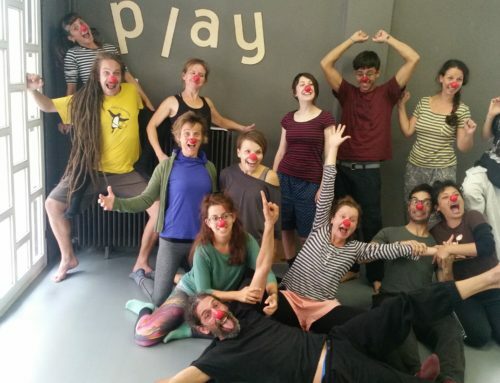 These meetings give an opportunity for participants to get in contact with the wider Hungarian circus community. 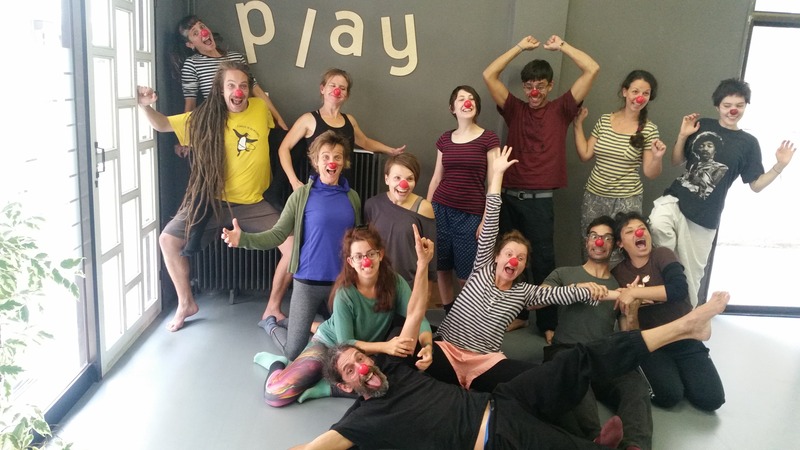 – On the evening of arrival, 1st April there is the Birthday of the Inspiral Circus Space which is a reunion with all members, the crew and our circus partners. 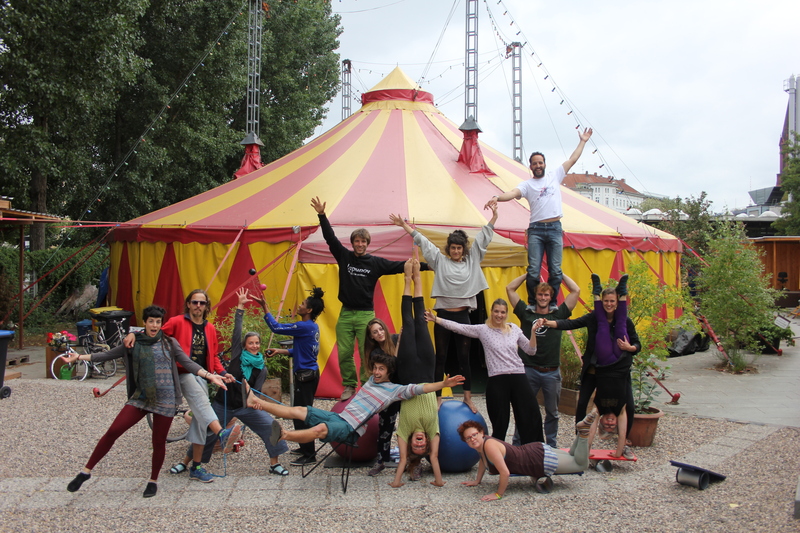 – On Thursday there is usually the Acro Jam meeting in Inspiral, which this time is going to be dedicated for making acro-friendships. The first hours 6pm-7pm is especially for that, and then the whole evening is free for practice until 10pm.